The Kansas State offense pushes into the TCU endzone for a touchdown during the Horned Frog’s 14-13 victory Saturday. Photo by Cristian ArguetaSoto. There’s injury troubles, and then there’s what TCU football has gone through this season. TCU head coach Gary Patterson said Tuesday that about 40 players have missed at least four games throughout the season with injuries. From starting quarterback Shawn Robinson to the Horned Frogs’ top defensive tackle Ross Blacklock, who suffered his injury in fall camp, the team has suffered about 20 season-ending injuries on both sides of the ball. 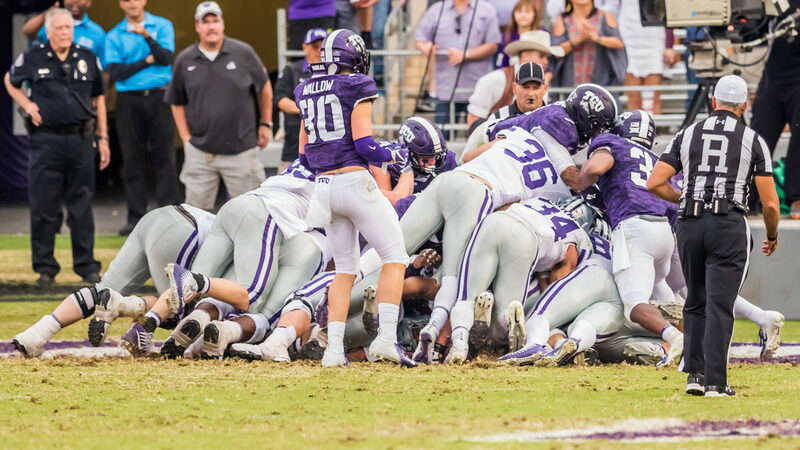 As a result, TCU’s scout team is struggling to field 11 players in practice, leading to a kicker needing to play the role of scout team defensive end. However, TCU’s goal to play in a bowl game is unchanged. The team’s margin for error is now razor-thin, needing to win two of their last three to get to a bowl-eligible 6 wins. This week’s contest provides a tall task, with the Horned Frogs having to travel to No. 9 West Virginia as double-digit underdogs before they face Baylor in Waco and then wrap up the regular season with a home game against a feisty Oklahoma State. The stretch has Patterson weighing the pros and cons of an early finish to the 2018 season. Patterson’s closest reference point for this season is TCU’s first season in the Big 12 when it had to play 17 true freshmen. Patterson said he’s down seven safeties, including two long-time starters in Innis Gaines and Niko Small. Garret Wallow, the team’s leading tackler, isn’t being used as a full-time linebacker anymore since he has to step into his previous position at strong safety with the high injury totals. The Horned Frogs have not attempted to pin the blame on injuries as the cause of a losing record. Patterson’s secondary has managed to still hold the Big 12’s best pass defense, allowing 190.7 yards per game. TCU’s defense will be faced with the tough task of maintaining West Virginia’s high-flying offense as they boast one of the top passing attacks in the Big 12 with quarterback Will Grier at the controls. David Sills V, West Virginia’s top receiver, has recorded 626 receiving yards and a Big 12-best 11 touchdown catches this season. Sills V also led the nation in touchdown receptions a season ago with 18. Gary Jennings Jr., Grier’s No. 2 receiver is right behind Sills V for the conference lead with nine touchdown catches. Kickoff Saturday in Morgantown between TCU and West Virginia is set for 11 a.m.